Polish Hebraist; born at Meseritz (Mezhiryechye), Poland, Dec. 23, 1772; died at Hamburg Feb. 20, 1845. Prompted by a love for learning which he could not satisfy in Poland, he went to Berlin when only seventeen. There he became friendly with the poet Wessely, who inspired him with a great passion for Hebrew poetry, which he cultivated until his death. The publication of the Hebrew literary review "Meassef" having been interrupted, Cohen undertook its continuation, and enriched it for two years with his own contributions. In 1813 Cohen spent a short time in London, in the endeavor to found there a Hebrew school. Having failed, he returned to Germany and settled in Hamburg, where his friend Wessely resided. 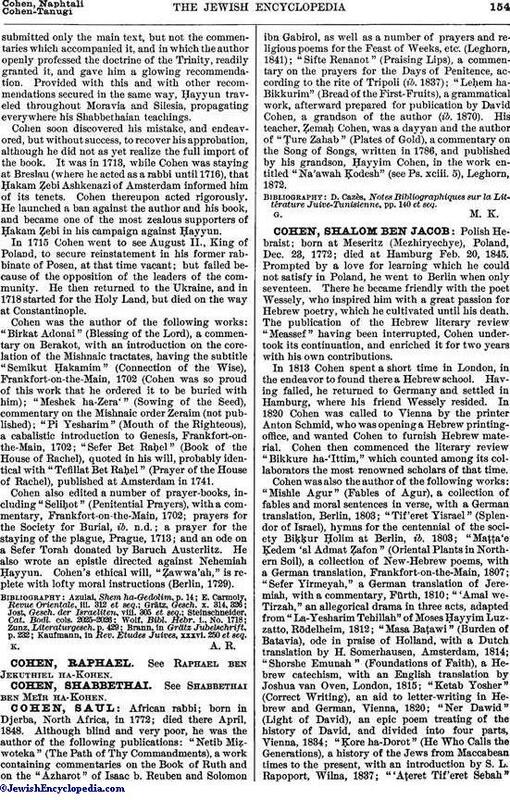 In 1820 Cohen was called to Vienna by the printer Anton Schmid, who was opening a Hebrew printing-office, and wanted Cohen to furnish Hebrew material. Cohen then commenced the literary review "Bikkure ha-'Ittim," which counted among its collaborators the most renowned scholars of that time. 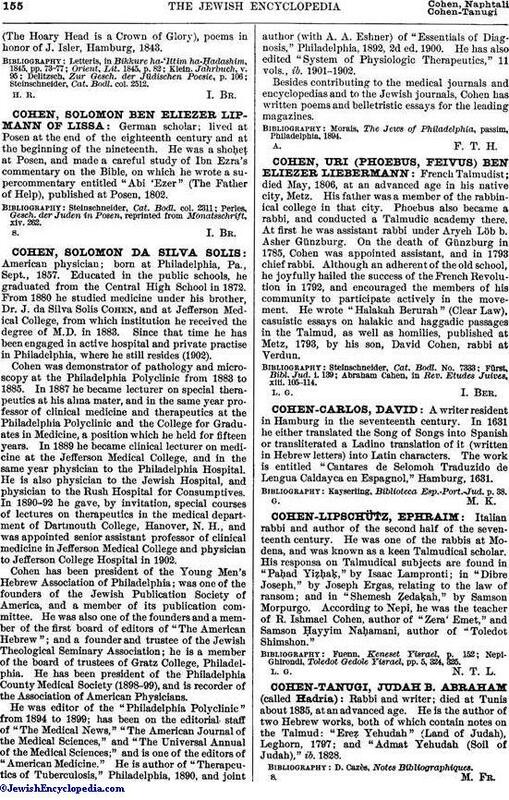 Cohen was also the author of the following works: "Mishle Agur" (Fables of Agur), a collection of fables and moral sentences in verse, with a German translation, Berlin, 1803; "Tif'eret Yisrael" (Splendor of Israel), hymns for the centennial of the society Biḳḳur Ḥolim at Berlin, ib. 1803; "Maṭṭa'e Ḳedem 'al Admat Ẓafon" (Oriental Plants in Northern Soil), a collection of New-Hebrew poems, with a German translation, Frankfort-on-the-Main, 1807; "Sefer Yirmeyah," a German translation of Jeremiah, with a commentary, Fürth, 1810; "'Amal we-Tirzah," an allegorical drama in three acts, adapted from "La-Yesharim Tehillah" of Moses Ḥayyim Luzzatto, Rödelheim, 1812; "Masa Baṭawi" (Burden of Batavia), ode in praise of Holland, with a Dutch translation by H. Somerhausen, Amsterdam, 1814; "Shorshe Emunah" (Foundations of Faith), a Hebrew catechism, with an English translation by Joshua van Oven, London, 1815; "Ketab Yosher" (Correct Writing), an aid to letter-writing in Hebrew and German, Vienna, 1820; "Ner Dawid" (Light of David), an epic poem treating of the history of David, and divided into four parts, Vienna, 1834; "Ḳore ha-Dorot" (He Who Calls the Generations), a history of the Jews from Maccabean times to the present, with an introduction by S. L. Rapoport, Wilna, 1837; "'Aṭeret Tif'eret Sebah"(The Hoary Head is a Crown of Glory), poems in honor of J. Isler, Hamburg, 1843. Steinschneider, Cat. Bodl. col. 2512.